Official artwork of Black Panther: The Album - Music from and Inspired By, which was curated by Kendrick Lamar and released by TDE/Interscope Records. I think that we can all agree that Black Panther is amazing. 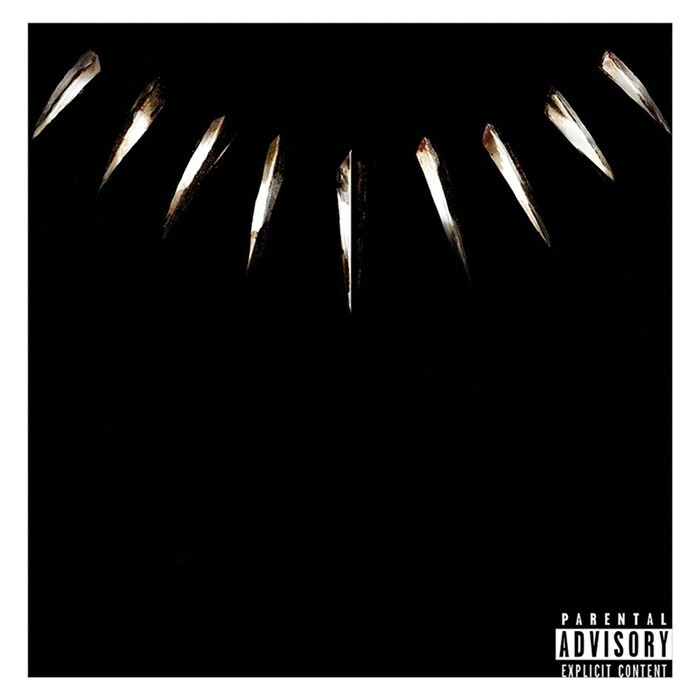 What is so amazing about Black Panther (other than the amazing acting, the wardrobe, the action, and the beautifully melanin-infused cast) is that Kendrick Lamar (and Anthony “Top Dawg” Tiffith of TDE) curated and released an album that accompanied the film. According to Ryan Coogler in an interview with NPR, Coogler asked Kendrick to make a few songs for the film. After watching a part of the film, Kendrick asked to curate an album for it, which became Black Panther: The Album. However, his project isn’t the only music project to accompany Black Panther the film. There’s an official movie score soundtrack for the film that came out the day the film premiered in theaters. The original score of the film was done by Ludwig Göransson, who is known for his work on Childish Gambino’s projects, including “Awaken, My Love…” as well as for Coogler’s previous projects, Fruitvale Station and Creed. Coogler discussed in his NPR interview that both projects serve as a balance to the movie and current pop culture: it’s essentially a joint project best for everyone. It’s very safe to say that Black Panther: The Album is for the honorary Wakanda residents of the world who dream of its actual existence. I mean...who doesn't love the tech savvy country in Africa that's richer than the countries that have to offer them aid? And the gorgeous people? That's a whole different conversation. While it’s extremely dope that Kendrick Lamar curated music to coincide with a major blockbuster film like Black Panther, it’s not impossible for other music creatives to work their way up to do the same. (There’s some that should have done it by now, to be honest: peep Yoh's DJBooth article on hip-hop artists that could have curated some dope sountracks already.) So, if you don’t have Kendrick Lamar’s pull or influence and want to start flexing your ability to provide soundtracks to visuals (or even audio), look into these five mediums. In a previous post about other places to pitch music to other than blogs, I mentioned vlogs on YouTube. With the increasing popularity of vlogs, those are a great place to have your music not only placed but to have curated music for. Sharing multiple songs (with various sounds for different moods and scenes) with the vlogger to use would be a dope way to curate and promote music on the platform. This platform is even better for a producer to use, which would make it easier to use in the background of talking scenes. I also discussed this medium in the same article mentioned above. Series, in general, use music submissions or discover artists for the purpose of describing a mood in a scene. The right song choice can shape the scenes and emotions so well when it’s done right. Using artists (especially music creatives) as music directors for a web series is the best thing because musicians understand how to set a mood with sound. There are so many series out and are being worked on that you can tap into. Research, reach out and see what happens. Have you noticed that most podcasts that you listen to don’t play music? It’s because of copyright and licensing issues. The podcast owner must have the permission of the copyright owners in order to play or share music on another platform (which explains why most people get their videos muted or removed from places like YouTube and SoundCloud: they don’t own the music that they share or have altered in sampling). However, if the creator's music is without copyright infringement and the podcast owner likes the music, then the creative and the podcast owner can come up with a licensing agreement to play the music on their podcast. Make sure to read this comprehensive article from Amplifi Media on music on podcasts to understand how it works and the risks involved. If you go down this route, make sure everything is covered in the paperwork. Urban music is more influential than ever now and our art and culture should be included in the soundtrack of our visual art experiences. So, instead of muzak (aka elevator music), why not hip-hop? Imagine hearing Kanye West’s My Beautiful Dark Twisted Fantasy-type vibes as you walk through a museum like MoMA. It would be super cool to hear some hip-hop, R&B or jazz in the curation of a museum exhibit or used during an audio tour at a museum. This idea would be good for exhibits, art shows, small museums like the In My Lifetime: Mini Hip-Hop Museum in Baltimore (help them raise money for a new space by donating here) as well as larger museums. Ever thought about putting out a compilation album, like Solange did with Saint Heron? Find amazing creatives that wouldn’t mind contributing to it and release all of their work together in one project. Make sure the paperwork and agreements are right between all parties. If you don’t want to go that route, then you can assemble playlists on any music streaming platform. Find Transcending Sound on Twitter, Instagram, Facebook, and sign up to receive our newsletters.